One of the things I find that I often do is to look through a wall rather than at it. That is, every time I see a blank wall, I ask myself, “what can I do inside that wall?” I guess because I am a space hog, I hate to ignore those 4-6 inches of space that are just sitting there being wasted. (an obsession that I am sure my dh really wishes that I didn’t have) 😉 But today, i invite you to join me with imagining how that space can be used add that something extra to your home with these 8 niche ideas. Probably the most obvious niche location would be in a shower. 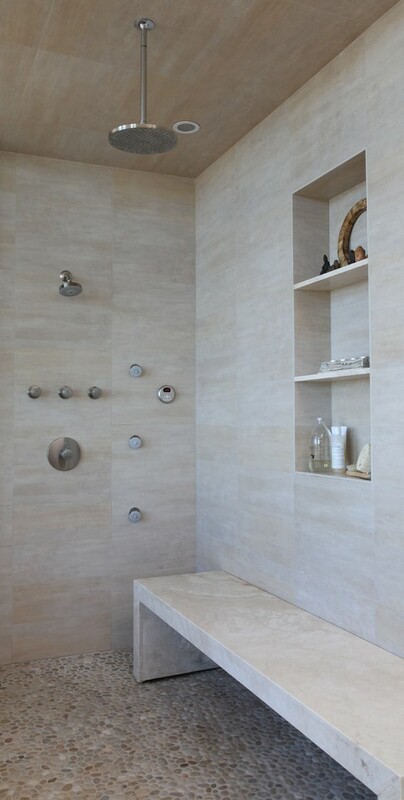 For practical purposes, this is something that anyone tiling a shower should consider. The space is right there between the studs just waiting for you. Plus, it makes a shower have that detail to finishing touches. 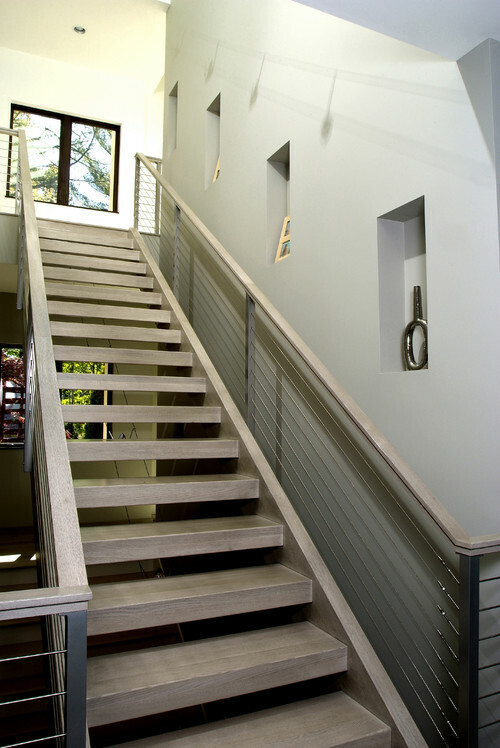 One of the most often ignored wall spaces is along the stairway. However, a few niches filled with some artwork can look fabulous. And, if you are one of those people that like to display family photos in this location, a niche can be a nice touch. This is by far my favorite idea. An unlikely niche location to provide extra storage space. I love the way this cabinet gets that little bit of something extra by utilizing that, less than obvious, side wall. I like to use this handy little trick for bathroom vanities. FYI – This would make a great location for books, as well. 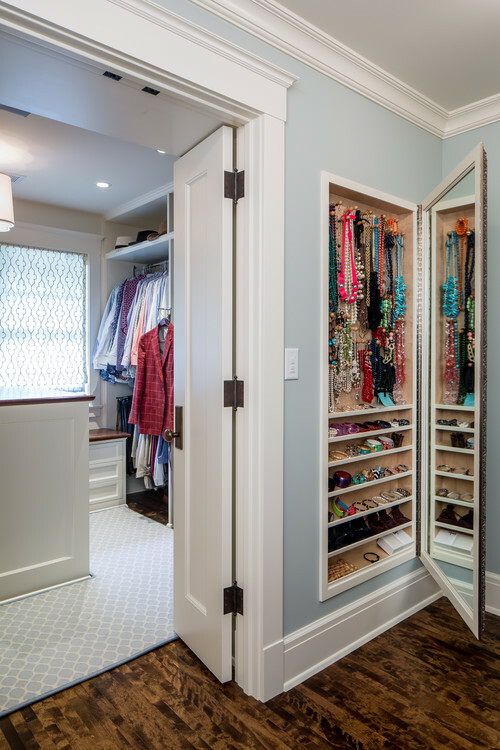 Need some space for your jewelry to be displayed? Consider the space behind your full length mirror. That 4″ of space is great for baubles and do-dads. Just recess everything in between the studs and then put your mirror on hinges. No one will ever know that it is there. Got one of those small bedrooms that you just can’t squeeze a nightstand into – at least not comfortably? Well, a nice little niche can solve the problem. These niches give this guest room some much needed, standard amenities. 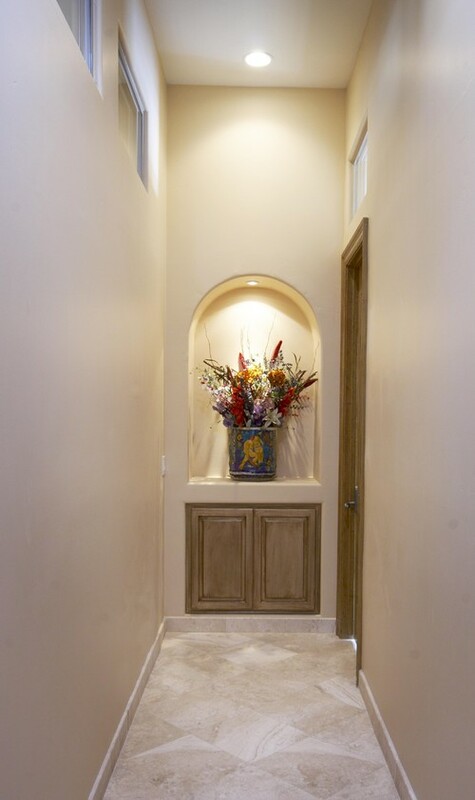 Does your hallway just end with a blank wall? Consider a niche to dress it up a bit. It makes it seem like there is a purpose to the hall other than to just hold a row of doors. If the wall is deep enough, consider adding a linen closet or an extra storage cabinet here. 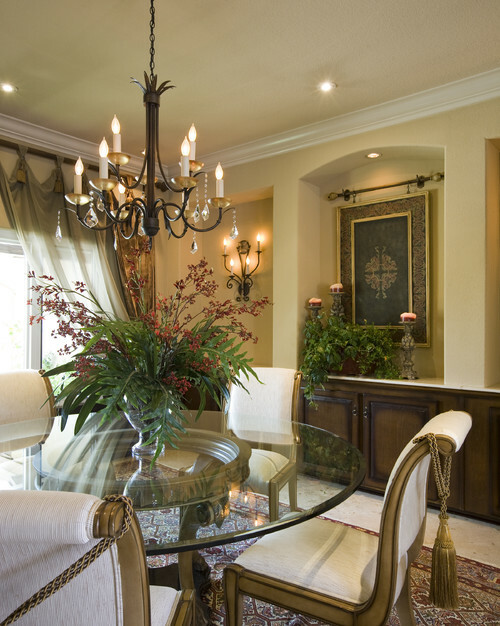 Recessing a buffet or sidebar into a niche can allow more space in a dining room. This comes in handy especially if the room is small. In addition, it creates an art piece out of furniture. 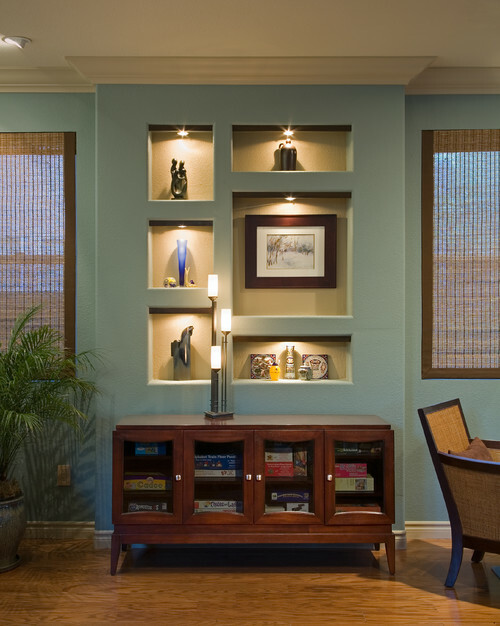 A set of custom sized niches is a great way to show off a collage of artwork. It lends texture and dimension to the wall, and it allows for more than just framed pieces to be made into a set. A niche is a great way to add storage and/or to spice up your decor. There is a good amount of space just hiding behind that sheetrock. So, you may as well put it to good use. Hopefully, these niche ideas have inspired you on how to do just that!